Our mission is to develop a trails system that will increase quality of life for area citizens, attract visitors and help recruit and retain businesses in our community and thereby increase jobs and improve our economy. Our primary goal is to build the “Stone Mountain Trail” through the Elkin Valley to the Stone Mountain State Park. This is a segment of the NC Mountains-to-Sea Trail. Our initial work is focusing on the Elkin & Alleghany Rail Trail leading from downtown Elkin to the Town Reservoir, which will ultimately connect with the Stone Mountain Trail. We are actively supporting The Yadkin River Blue Trail by working to support a boat/canoe/kayak landing at on the Mitchell River. We are working with the Town of Elkin to develop a mountain bike course. We support the eastern branch of the Overmountain Victory Trail that originates in the Elkin Municipal Park and that the Town of Elkin is working with OVT Superintendent Paul Carson to establish. We support the plans of the Yadkin Valley Heritage Corridor, Scenic Byway, Leaf to Vine Trail, Civil War Trail, Surry County Greenway Trails, Daniel Boone Trail and other trail systems that connect with the Elkin Valley Trails. Elkin is a veritable hub of trails. We have focused on the history of the Elkin & Alleghany Railroad and the importance of the Big Elkin Creek to the northwest North Carolina economy. We plan to integrate the study of flora, fauna and aquatic life on our area trails. We plan to stimulate walking, hiking, cycling, horseback riding, fishing, canoeing, mountain biking, kayaking and canoeing. We plan to develop campsites, trail heads, signage, etc. 1. Laid out a two mile wide hike, bike and horse corridor through the Elkin Valley from Elkin to Stone Mountain State Park and developed handshake and permanent easements of much of this trail. 2. Worked with the Friends of the Mountain to Sea Trail (MST) to re-designate our trail as the primary MST Road Route from Stone Mountain State Park to the Yadkin River. 3. Obtained support from Surry County Commissioners, Surry County Greenway, Yadkin Valley Heritage Corridor, Piedmont and High Country Council’s of Government, Elkin Mayor and Commissioners, Elkin Parks and Recreation Advisory Committee, NC Horse Council, North Carolina Rail-Trail Inc, multiple businesses and individuals. 4. Designed a bridge and raised money to build it. 5. Gained new easements and permissions to construct our trail in town. 6. Researched the Elkin & Alleghany Railroad and have a proof of a new book to publish on this topic. 8. Rediscovered the fact that Elkin is on the Daniel Boone Highway and are working to remount a Daniel Boone Trail Plaque. 9. Worked on trail maintenance projects in Elkin and at Stone Mountain. 10. Became a Lowe’s Hero; Lowe’s built an information kiosk already erected at Municipal Park and two more pending. 11. 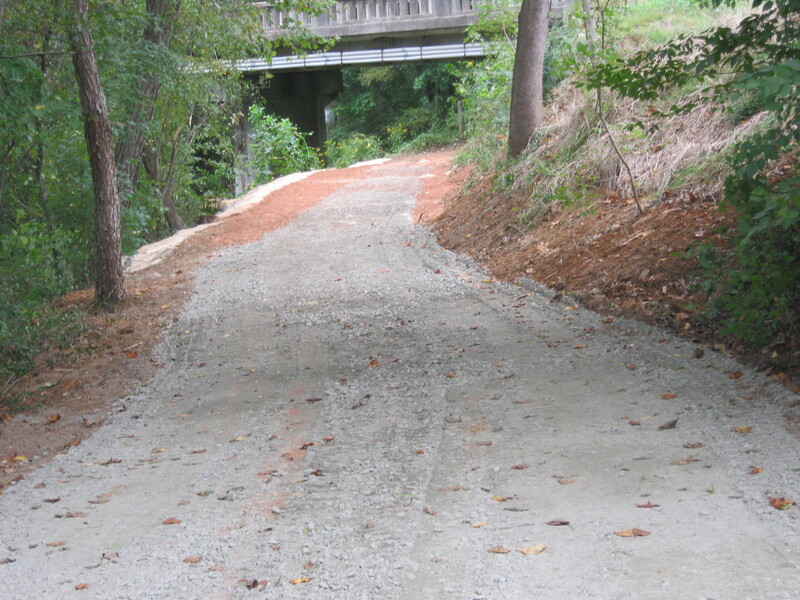 Was awarded grants by the Winston-Salem Foundation and Lowes’ to bridge gaps in the trail. 12. Put on the Duck & Turtle Regatta, Boots & Bridges Boogie and Harry’s fundraiser. 14. Worked with the Duke University Nicholas School of Environmental Management to write a preliminary watershed plan for the Elkin Creek to reduce silt and improve aquatic habitat. A more formal study is beginning now with the Piedmont Council of Government with the Town of Elkin and others involved. A special thanks goes to the Governing Group and Steering Committee of active volunteer citizens who have been the leaders working to accomplish our objectives this year.